A high-level networking event on how to conduct business in East Asia was hosted in London by LID Publishing on Friday 24 November. Speaking at the event were international strategist and author Takeo Harada and consultant and author Jon Geldart. 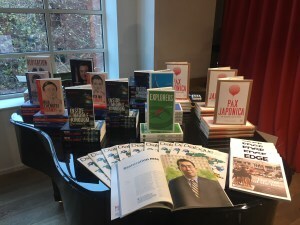 Held at the iconic Charing Cross Foyles bookshop, the event welcomed an audience of key Chinese and Japanese business thought-leaders and executives. Mr Harada spoke about the ideas expressed in his book, Pax Japonica, on the restoration of Japan as a global economic power. He described the challenges of the closed doors in the global financial community, global alliances and secret funds. Jonathan Geldart discussed the personal and business insights he has gained through living and working in China, and his experience of its evolving economic landscape. The audience was then invited to take part in what was a lively Q&A session, chaired by Dialogue editor Ben Walker, which debated the wider implications of China and Japan working both together and with the rest of the world. Takeo Harada is the CEO of the Institute of International Strategy and Information Analysis, a leading consultancy and think tank. Before that, he served in the Japanese Ministry of Foreign Affairs as a diplomat for 12 years. Jon Geldart is an executive director for Grant Thornton, responsible for strategic markets development in China. He is also a chairman for the European Union Chamber of Commerce in China. The books are available to buy from the LID Publishing website.